The Stephen S. Fuller Institute is the premier source for information and analysis of Greater Washington’s regional economy. Through consistent monitoring of regional issues and the economy, the Institute is able to identify critical conditions and trends impacting the future vitality of the Washington region’s economy. Regularly communicating these findings and producing timely research on short- and long-term regional policy options ensure local business and government leaders are equipped with the data needed to make informed decisions regarding the region’s future. The Institute is led by longtime regional economist Stephen S. Fuller, Ph.D. and is part of the Schar School of Policy and Government at George Mason University. The Institute was founded in 2017. Read a report of what the Institute accomplished in its first and second years. Professor Fuller joined the faculty at George Mason University in 1994 as Professor of Public Policy and Regional Development. He served as Director of the Ph.D. Program in Public Policy from July 1998 to June 2000 and from July 2001 to July 2002. In September 2001, the GMU Board of Visitors appointed him University Professor and in July 2002 he was named to the Dwight Schar Faculty Chair and Director of the Center for Regional Analysis; he served in this capacity until May 2015. He currently holds the position of Director of The Stephen S. Fuller Institute. Prior to joining the George Mason University faculty, he served on the faculty at George Washington University for twenty-five years, including nine as Chairman of the Department of Urban Planning and Real Estate Development and one as Director of Doctoral Programs for the School of Business and Public Management. Dr. Fuller received a B.A. in Economics from Rutgers University (1962) and his Doctorate in Regional Planning and Economic Development (1969) from Cornell University. He has authored more than 800 articles, papers, and reports in the field of urban and regional economic development including monthly reports on the Washington metropolitan area (2/91 to 2/11) and Fairfax County economies (6/97 to 6/09). Professor Fuller’s recent research has focusing on the structure of the Washington metropolitan area economy, how this changed during the Great Recession and how it will change going forward as its federal-spending dependency diminishes. He has also undertaken research on the changing workforce requirements of the Washington area’s emerging economy and the housing requirement of this future workforce. His current research involves the projected demographic changes over the next fifteen years and how these will impact the Washington area’s workforce, housing market, and demand for public services. Professor Fuller was recently appointed to serve on the Joint Advisory Board of Economists by Governor McAuliffe. He served on the Governor’s Advisory Board of Economists under Governors Kaine, Warner, Allen and Wilder. In 2003, he was a member of the Governor Warner’s Tax Reform Working Group. He also is a member of the DC CFO Business Advisory Group of the District of Columbia, the Montgomery County Business Advisory Panel and the U.S Army Women’s Foundation. His international assignments include Kazakhstan, Georgia, Hungary and China as well as on-going projects in Portugal. He served on the Board of Directors of Tompkins Builders Inc., a DC-based company, from 2004 to 2012, and currently serves on the Boards of the Global Environment and Technology Foundation and Northfield Mount Hermon School in Gill, Massachusetts. In May of 2015, Dr. Fuller was elected as Chair of the Board of Trustees of the Northfield Mount Hermon School. Jeannette Chapman joined George Mason University in 2013 as the Research Associate at the Center for Regional Analysis (CRA). Prior to joining George Mason University, she was the Research Associate for Economic Growth and Development at the DowntownDC Business Improvement District (BID) where she analyzed the major sectors of the downtown D.C. economy. What is the mission of The Stephen S. Fuller Institute? The mission of The Stephen S. Fuller Institute is to undertake and disseminate research on critical conditions and trends impacting the vitality of the Washington region’s economy to ensure local business and government leaders are equipped with the data needed to make informed decisions regarding the region’s future development. Who is in charge of carrying out this mission? 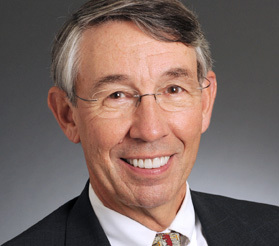 Leading regional economist Stephen S. Fuller, PhD, is the Institute’s Director, while Jeannette Chapman serves as Deputy Director and Senior Research Associate. Along with external partners, they act as an economic SWAT team for the region. The duo continuously monitor Greater Washington’s regional economy and communicate their findings to the public, business leaders, and government organizations. How is the Institute working to achieve this mission? The Stephen S. Fuller Institute produces a monthly report—Washington Economy Watch—that provides local business, government leaders, and other stakeholders including the general public with a consistent analysis of the regional economy to ensure they are equipped with the information needed to make informed decisions regarding the future of Greater Washington. Additionally, the Institute will be issuing topical research reports and tracking the progress of The Roadmap for the Washington Region’s Economic Future on an ongoing basis. We intend to host regional economic policy discussions and will have an annual forum to discuss the state of Greater Washington’s economy. The inaugural economic forum will be held on October 4, 2017 at George Mason University. What is the impetus for launching The Stephen S. Fuller Institute? Our regional economy is at a pivotal point. Right now, we are in the midst of one of the longest business cycles, and a recession is likely in the foreseeable future. The Institute’s research is designed to help regional leaders anticipate changes in the economy’s direction and other changes that will impact the economy’s vitality. The Washington region’s economy has become less dependent on federal spending to drive its economic growth since 2010 when federal spending peaked. To better understand how our regional economy can successfully navigate this shift, a broad coalition of regional business leaders came together to support The Roadmap for the Washington Region’s Economic Future. The Roadmap research, led by Dr. Fuller, identified the competitive strengths and weaknesses of the region, as well as the advanced industrial clusters well positioned for growth in the region. The Roadmap provides a framework for local leaders over the next decade to diversify the region’s economy for long-term stability and global competitiveness. The Roadmap was released in January 2016, and the Institute is tracking the progress made to move its recommendations forward. As the region’s economy has pivoted away from this federal dependency, it has become more sensitive to national and global economic performance. Therefore, the region’s economic performance will need to be carefully monitored over the next several years. This is the principal objective of each month’s Washington Economy Watch that reports both the national and regional indicators that provide historical precedence for tracking future economic turning points. How is The Stephen S. Fuller Institute being funded? The Institute is fully funded through January 2020 via private donations. More than 30 donors contributed to funding the Institute, with George Mason University providing office space and overhead costs.